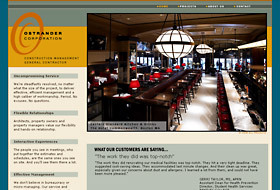 Ostrander Corporation wanted a clean and elegant web site to highlight their contracting and construction work for retail, banking, and institutional clients. We placed an emphasis on large photographic images to show their work at its finest. Flash was used for the home page slideshow and the projects presentation widget.